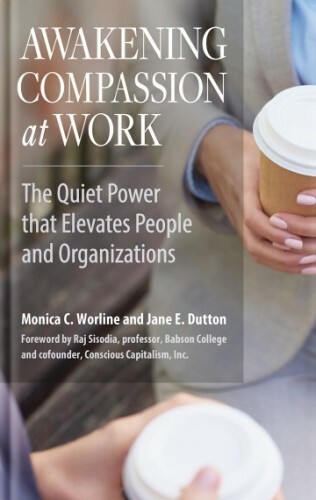 The new book by Monica Worline and Jane Dutton opens our eyes to the power of and importance of compassion in organizations and reveals caring as a competitive advantage that fuels innovation, service quality, adaptability, retention, and more. "Awakening Compassion at Work is a must-read for any leader aspiring to catalyze high engagement, productivity and joy in their workplace. What a powerful book!" Suffering in the workplace can rob us of humanity, dignity, and motivation. Often silent and left unaddressed, suffering is a costly drain on organization productivity and potential. Marshaling evidence from two decades of research with organizations in a variety of industries and sectors, scholars and consultants Monica Worline and Jane Dutton show us how small actions can have big effects. Offering a view of compassion that is grounded in the best of social science research and the new science of compassion, this book teaches four ways that anyone, regardless of position or role, can bring more compassion to their work lives. "Awakening Compassion at Work is a remarkably thorough and compelling read that will remind you how much more potential exists if we can bring more care and compassion into our organizations." When you join our community of compassion architects, we share strategies and evidence for how you can make the case for compassion and unleash the force of compassion in your workplace. "The definitive guide to research and practice on unleashing compassion at work. The world's leading experts reveal how we can build teams and organizations where people stop checking their values at the office door and start caring about each other."